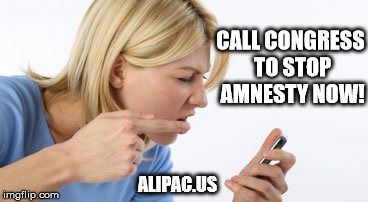 Thread: ALIPAC Blocked: Twitter Says Calling Congress Against Amnesty Legislation is "Hate"
ALIPAC Blocked: Twitter Says Calling Congress Against Amnesty Legislation is "Hateful"
Americans for Legal Immigration PAC's efforts to encourage Americans to call members of Congress to oppose impending DACA Dream Act Amnesty legislation have been hindered by the Twitter Corporation which blocked ALIPAC's boosted post ad claiming it is "Hateful Content." 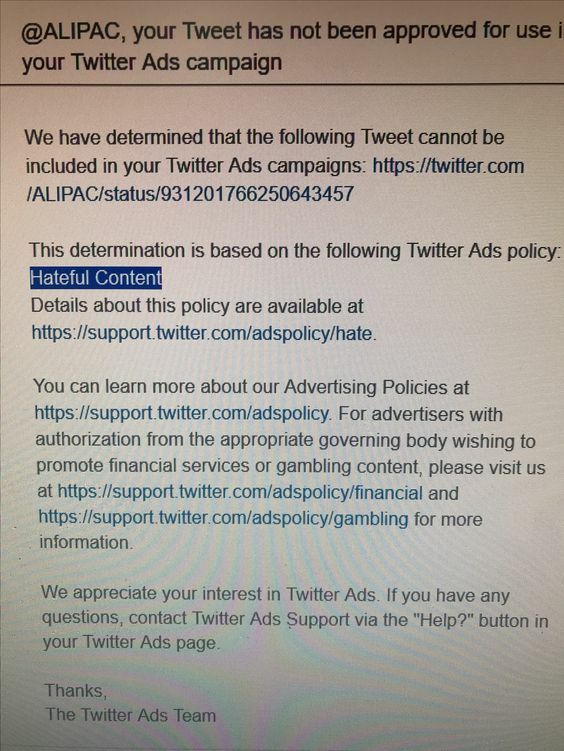 Twitter is also refusing to verify William Gheen's @ALIPAC account despite the fact the account meets all of Twitter's published guidelines for verifiable accounts. "It is time for Congress for the FEC to step in and stop corporations like Facebook, Google, and Twitter from using their power to influence free speech, campaigns, elections, and legislation and time for Congress to break up these monopolies and apply regulations to protect citizens from abuse as we have done with phone and power utilities," said William Gheen, President of ALIPAC. "Google, Twitter, and Facebook are all providing unequal services for us based on our creed. Our creed is our shared belief with millions of other Americans that Amnesty for illegal immigrants is destructive to America and our existing immigration laws should be enforced instead. For this creed we share, mega corporations like Twitter are targeting us for abuse, censorship, and discriminatory treatment." Last edited by ALIPAC; 11-16-2017 at 03:24 PM. Read over the past couple of days that accounts are being unverified by Twitter. They are silencing conservatives and others. Facebook is doing the same, too. Last edited by GeorgiaPeach; 11-16-2017 at 03:34 PM. Answering challenges to calling S.1639 "amnesty"